I really was indecisive this year as to what to make for Teacher Gifts. My son's class was sorted - all the Mums put in for a voucher - but I couldn't decide on what to do for my daughter's pre-kindy teachers, who are all superstars and really do excel at their job. My son also went to the same centre before he started "real school" so these ladies have been in our life for a few years now. I wanted to give them something a little different to the norm and while I know they do love the chocolates and lollies that come pouring in, I also knew they'd appreciate something a little less detrimental to their waist-lines! Last year my sister gave me a jar of her muesli for Christmas - actually a jar of "Shanola" (her name is Shannon - yes, she's hilarious!!) and it was divine. I begged and pleaded asked her for the recipe so that I could recreate it for my special people this year. It has a mountain of goodness in it and is toasted in very little oil, maple syrup and vanilla paste. A lot of toasted muesli's get a bad rap because of the fat content but this one is different... it's good, very, very good. In fact one of my friends said "You should rename it to Better Than S-x Muesli" (I'd better not put in the full S word in case my site loses its G rating!). Anyway, I'm sure you can gather from her comment that it's pretty fine stuff. The perfect Xmas gift (thanks for the introduction, sister) and a great alternative to the bucket-loads of sugary treats around at this time of the year. 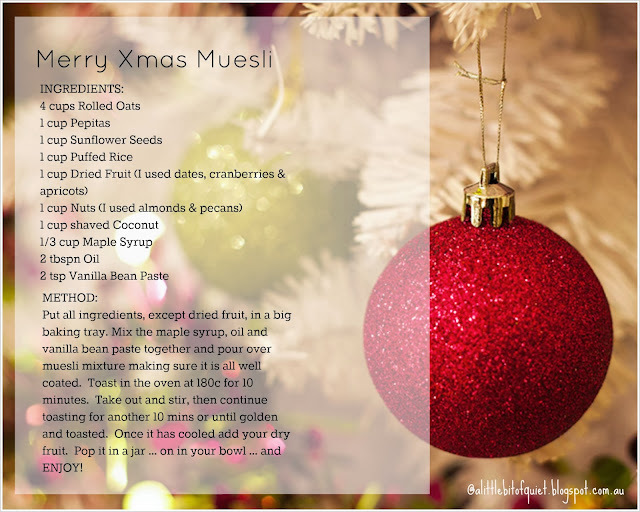 Here's the recipe, and just because I heart you all, here's the gift tag to go with it! For classroom treats, I was also a little stuck. Our kids get so many lollies and chocolates at this time of the year from their classmates, which they love and I don't stop them from eating them, that I actually just didn't feel comfortable giving the same treats back when it's not what we eat or buy in our house. In the end, I decided to make some "Goodie Balls" - a healthy, delicious chocolate ball made from dates and raw cacao. I think these balls are a delicious snack and both of my kids eat them. I'm hoping the little ones in my son's class enjoy them but if not, I'm sure their parents will! I made up a generic gift tag so, although time is now pretty short, if you want to make some for your kids classmates this Christmas, feel free to use the "Goodie Balls" tag. I used this recipe (the very first one on the page) from Accidental Greenie and just popped four little balls in each bag (actually they looked very much like reindeer droppings but it was too late to rename them!!). And remember how I said my son's teachers were "sorted"? Well, they were (as I said above, we all put in to buy them a voucher each) but we did that about a month ago and today as I was driving home from school, appreciating his school and the work both his teachers have put in this year, I just really felt I wanted to put a little something together for them. Nothing like last minute and at the eleventh hour. I knew exactly what I would do and I knew I had all the bits I needed. My son and I made these - a little beaded heart Xmas decoration for each of them. Because we really do "heart" them! They are very easy to make. All you need is some florist wire (I bought some about six months ago when I was going to make a headband for my daughter), some beads (I bought the wood beads about six months ago when I was going to make a necklace for my daughter ... can you see a pattern here? Lots of intention but zero productivity!) and a piece of ribbon. Thread the beads on the wire (this is the bit my son did), join the wire by squishing the ends together (I didn't really have a good method, I just kept twisting the ends until it felt strong) and then add a ribbon right over the join. Shape into a heart. Done. Pretty. And that's me, done, for another year. Now I'm off for a nap. How about you? 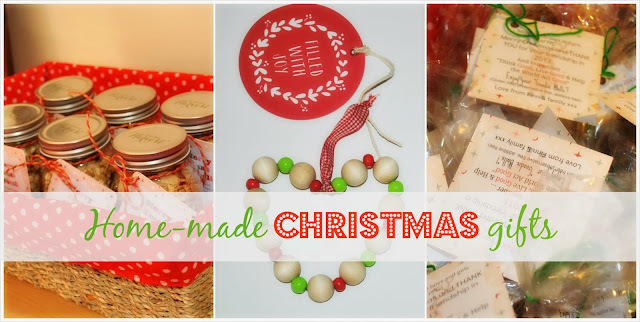 Do you do the "handmade thing" at this time of the year or do you prefer the ease of "the click", or, goodness-gracious-me, actually go out and do "real shopping"? I LOVE all three options - it just depends on time, my mood and the occasion. Either way, it's giving and that's lovely, isn't it? Oh my, you have gone to so much work for this - it is just delightful and so thoughtful of you - I wish I was in your inner circle come Christmas time - lovely.